The 2-bedroom 1-bathroom suite on the west side of the open-air retail center has lots of character, ambiance and space. 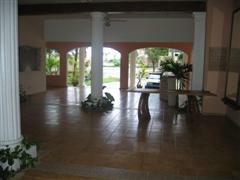 A grand open-air reception hall/ballroom doubles as the dining room for all the renters. With the regal columns for a backdrop, it accommodates dozens of diners as easily and elegantly as that cozy table for two. The commercial-sized kitchen is an ideal prep area, whether creating special occasion dinners for a party, or an intimate dinner, just for two. The hall door leading to the front bedroom of the 2-bedroom 1-bathroom suite, is painted with a night scene of the Dallas skyline. We call it our Dallas suite. 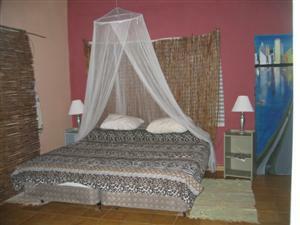 The bedroom is large and airy with lots of room for the king-sized bed. 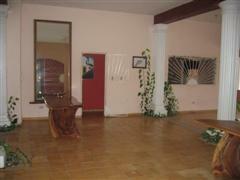 A sunny bright living room adjoins the front bedroom. 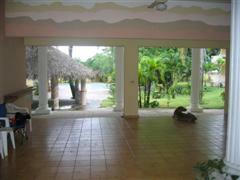 It has 3 large windows plus an outside door leading to the garden. The open design allows a cooling breeze to flow through the whole suite, making it unnecessary to have air-conditioning. The Dallas suite may be rented separately. 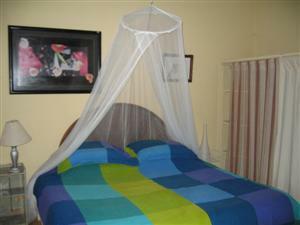 It's rates are based on double occupancy. A short hallway connects this front suite to the back bedroom, with the bathroom in the center. 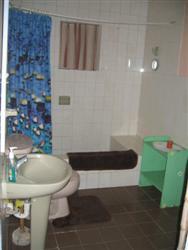 The large bathroom has enough space to double as a dressing room, complete with huge hot water shower, toilet, sink and storage cupboard. A prairie scene with railroads and grain elevators is painted on the door leading to the back bedroom. We call this our Prairie Room. 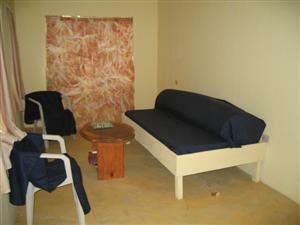 It can be set up with a king-sized bed or several single beds. 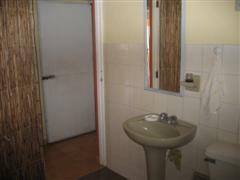 Its' rates are based on double occupancy. 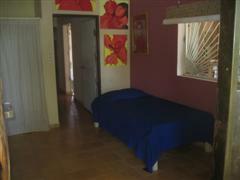 Both bedrooms have outside exit doors, so can be rented separately, with the shared bathroom in the center. Each one has a large closet with shelves and a clothes rod, + lots of floor space. Designed to sleep 4 people in style (rental rates are based on an occupancy of 4) the 2/1 suite can accommodate extra beds for 8 to 12 people quite easily. 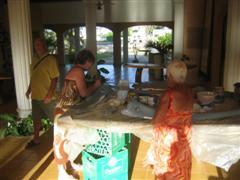 All renters have shared kitchen and dining room access. 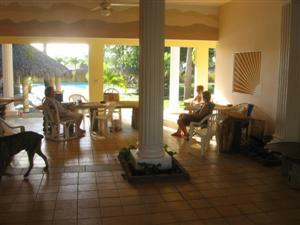 The grand open-air dining room doubles as a common area with lots of room and ambiance, cooled by a tropical breeze. 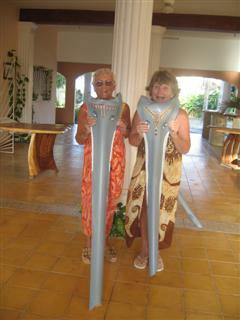 Our guests have great fun here, painting palm fronds into elephant heads. Let your "artiste" come out, inspired by the tropical surroundings. Good rainy day back up plan. If you're looking for a more basic accommodation, and enjoy a tropical breeze or fan instead of a/c, the 2-bedroom 1-bathroom suite is the right budget choice for you.